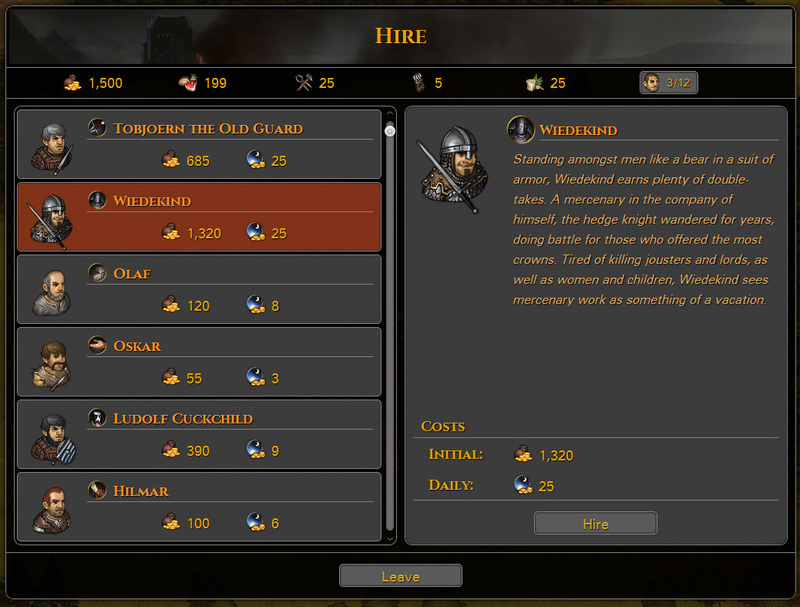 In Battle Brothers you take command of a band of mercenaries in a low-power medieval world with fantasy elements. This world is heavily inspired by central european culture and equipment during the early to high medieval age. The world is randomly generated at each start of a new game and is populated by various faction each with their own agenda and resources. The player will be just one part of this dynamic, living and breathing world.Below is an overview over core mechanics and gameplay elements you will find on the strategic worldmap. Here you manage your troops, decide where to go and who to fight. For each feature we also give you the current status if that feature is already implemented or if we are still working on it and have it on our backlog. All features that say “implemented” will be available in the Early Access version. On the procedurally generated worldmap different factions exist with their own agenda and resources, struggling for survival and dominance. A strategic AI leads each faction towards its goal by making use of its resources while staying true to the lore of that faction. 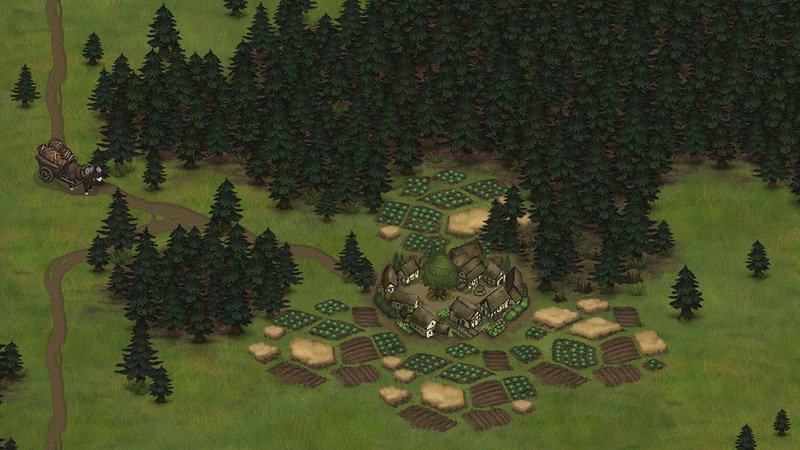 Factions own locations on the worldmap – villages, camps, crypts or similar – and send out parties from there with objectives such as patrolling the area, hunting for food or raiding an unsuspecting village. The player jumps into this living world and affects its balance by his actions – but the simulation works even without the player intervening. This way, the game does not have to rely on pre-scripted or linear events but provides new opportunities of adventure every time based on the dynamic interplay of its inhabitants. Furthermore, the player’s actions make a real difference. Preventing that orc raid on a village has that village able to offer you more in trade, and even just killing a single orc leaves the orc tribe with one less warrior for future encounters. Here is an example to help you understand how the simulation works: A village wants to trade with its neighboring village and gathers some of its resources to send them with a caravan along the road. A nearby banditcamp has send out scouts to see if there is any valuable target nearby. They spot the caravan and hide close to the road in the forest where they can not be seen. They ambush the caravan and bring the resources back to their camp, allowing them to send out more powerful parties while the village suffers. This is also the point where the village may issue a mercenary contract for caravan protection so the next caravan will not get raided. You can then take up that mercenary contract, earn your share by protecting the caravan and make an actual difference. When starting a new campaign of Battle Brothers you can choose the banner that your own mercenary company will fly throughout the game. In the future, we want to allow for the creation of custom banners. Those banners will consist of a banner shape, background pattern, main emblem and secondary emblem. Here are some banners that we created to showcase a few possibilities. Hiring Battle Brothers is one of the first things you’ll want to do when starting a new campaign. It’s also one of the things you’ll do all through the game as your men have a tendency to die heroic deaths. Each character that volunteers to join you has their very own background story, character traits and stats, and usually brings equipment of their own. You won’t be able to see any numbers besides the hiring fee at first, but the background of a character tells you what to expect; need a strong and sturdy man? Hire a lumberjack or a farmhand. Need someone with combat experience? Hire an expensive sellsword or a retired soldier – although the latter might not have the constitution of a young man anymore. You can equip every one of your characters as you like, and every piece of equipment is shown on the character bust. 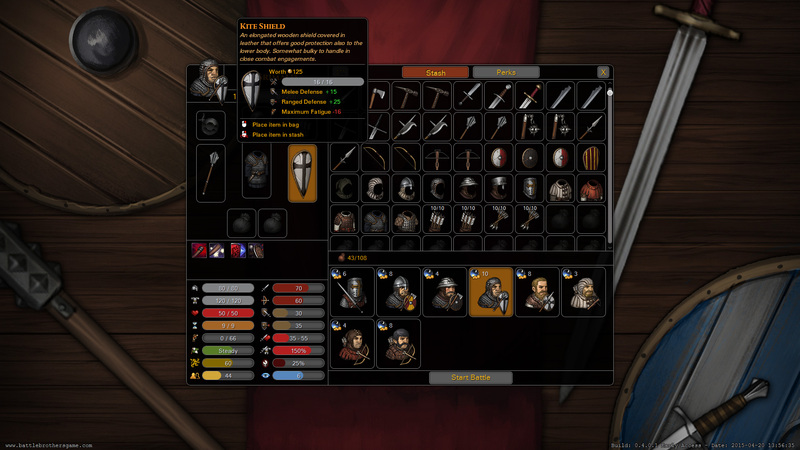 The items a character has equipped determine the skills they can use. A club allows you to stun an enemy, an axe can split enemy shields and a spear allows you to form a spearwall holding the enemy at bay. There is a vast amount of weapons, over 30 at the moment, each with their own skills, advantages and disadvantages. For defense there are shields, helmets and body armor ranging from light to heavy. While heavier armor and helmets offer better protection, they also have your Battle Brothers fatigue quicker and act later in combat. We have already dozens of helmets and armors in the game. An additional item category are accessories, mostly smaller items and trinkets that grant additional benefits or skill. An example would be a battle horn that can be used to increase the morale of nearby Battle Brothers in tactical combat and even rally them if they are fleeing from the battle. Accessories are not yet implemented. Similarly to other RPGs Battle Brothers will gain experience through combat and improve over time. On level-up you’re able to increase character stats and unlock one of 42 perks from three different categories: Offense, Defense and Utility. The more perks you unlock in a category, the more powerful perks you have access to, greatly increasing combat efficiency of that Battle Brother. On the worldmap the player also has to manage strategic supplies required to keep a mercenary company going. These are money, rations for food, armor parts for repairs, ammo for filling up quivers and medical supplies for treating wounded Battle Brothers. Running out of these supplies will lead to armor not being repaired, wounds not being treated and in the case of money and rations even to Brothers deserting you. The world of Battle Brothers is a dangerous one, but also one ripe with opportunities for people not afraid to use sword and shield to earn some coin. On your travels you will find many people offering to contract your mercenaries for various tasks, whether they seek protection for a caravan traveling to the next market, for recovering stolen goods or hunting down a notorious orc warlord. All contracts are the result of our dynamic world simulation and not just created at random. You can read more on contracts in our according blog article. Hidden in the world are powerful legendary artifacts, sometimes even magical in nature. They provide great benefits and may confer unique skills that open up entirely new tactical options in combat. However, these legendary artifacts are also very rare – only a few exist in each campaign, taken at random from a larger collection. They’re also very hard to come by, and you’ll have to invest some resources in order to locate them and claim them for yourself. While traveling the world a lot of unforseen things can happen and surprise you. These events can occur any time and any place and force the player to make a decision with varying outcomes. For example, if there is a Battle Brother with a criminal background in your warband, a passing guard patrol might recognize that character and demand the player to hand him over as a prisoner or face the consequences.